Għaxaq Music Events have become synonymous with high-calibre annual concerts and in the past have organised great shows featuring Modern Talking, Winter Moods and the Pink Floyd Project. This year’s concert, Long Live The Queen: The Ultimate Queen Show will feature Break Free, which is considered one of the best Queen tribute bands in Europe. 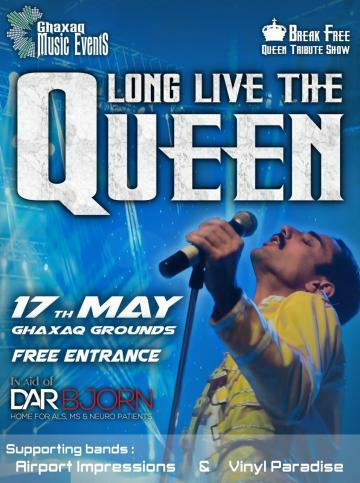 The concert, scheduled for Friday, May 17 at Għaxaq Grounds, will offer an exciting experience recreating a legendary Queen concert as faithfully as possible. Image and sound are studied in detail to achieve this goal. Thanks to their experience on the international music scene, the Long Live The Queen show is greeted with enthusiasm all over Europe – the tribute band fills public squares and amazes thousands of concert-goers. The band’s singer has been described by many fans as one the best Freddie Mercury impersonators around and his live performances are testimony to this. He has meticulously analysed the late Freddie Mercury’s body language on stage, his vocal timbre, pronunciation and all the necessary details that help him create the illusion of projecting the legend on stage. The same applies to the rest of the band members who recreate Queen's sound and movements. The band's energy really honours Queen's best performances in their golden years, and modern equipment and technical know-how make this show extremely appealing to the modern public. After the success of the film Bohemian Rhapsody, Għaxaq Music Events are keen to present this show which will include all greatest Queen hits including We Will Rock You, Bohemian Rhapsody, We Are The Champions, The Show Must Go On, and Love Of My Life. As done in previous concerts the organisers will create a memorable experience including fireworks. The event will also feature Vinyl Paradise and Airport Impressions who will kick-start the concert at 8pm. This live concert will be hosted by Pierre Cordina. Parking areas near the venue will be available. Entrance is completely free of charge and donations for Dar Bjorn will be collected at the door. For more information visit the Facebook page Għaxaq Music Events.